Loose /ˈluːz/ is a village some 2 miles (3 km) south of Maidstone, Kent, situated at the head of the Loose Valley, with which it forms the Loose Valley Conservation Area. The fast- flowing River Loose which rises near Langley runs through the centre of the village and once supported a paper-making industry, evidence of which can still be found. An area round the village is also known as Loose, but Loose village itself is based in the Loose valley and extends along Busbridge Road towards Tovil. The name is believed to be taken from the Loose Stream, which "loses" itself for several miles underground from the point where it rises in Langley (Edward Hasted: Hlosan in Saxon, signifying to lose or be lost). Loose originated in Saxon times, but its main period of growth was during the Industrial Revolution, when Loose, Boughton Monchelsea and Bockingford developed around the seven mills powered by the Loose Stream. There are several remains of the mills, including millraces at Leg O'Mutton Pond, Gurney's Mill, Loose Village Mill in Bridge Street, the mill ponds at Little and Great Ivy mills, and further down the valley in Crismill and Hayle, where the old paper mill stands with one remaining chimney. This site has now been redeveloped as housing. Further south are disused mine pits where Kentish ragstone was once mined, some being sent for use at the Tower of London. South along the Loose Road (A229), terminating at the post office, ran a tram track to and from Maidstone. Old Loose Hill descends into Loose village and the valley, the hill being so steep that in the 18th and 19th centuries consecutive landlords of The Chequers public house kept horses that were hired out to help haul carts to the top. The road is still lined with haul stones around which ropes were tied to help relieve the horses of the weight of the carts. Across the stream from The Chequers is Brooks Field. In the village, the Brooks Path is a picturesque causeway along the Loose Stream that joins the two ends of the village, dividing the mill pond which once fed the village mill. All Saints Church in the Diocese of Canterbury, overlooks this section of river. A local tradition has it that whoever sticks a pin in the old yew tree in the churchyard, then runs around it anticlockwise at midnight, will on looking through a small window above the Charlton Memorial against the church wall, see a vision of a woman killing a baby. The Reverend Richard Boys was vicar here and also chaplain of St Helena during Napoleon Bonaparte's exile on the island. He is buried in the churchyard. To the east of the village is the Loose Viaduct, attributed to Thomas Telford and built in 1830 to carry the Maidstone to Hastings road (the present day A229) across the Loose Valley. The village has two public houses. The Chequers is in the valley beside the river and The Walnut Tree on the main A229 opposite Loose Infant School and Loose Junior School, which share the same site. New Line Learning Academy is a secondary school located in the village. A third pub,The Kings Arms, closed in 2005 and is now a private house. In the centre of Loose Village there is a large 14th-century building, Church House. The world-famous "Gonzo" illustrator Ralph Steadman lives in Loose, and the 'Beechgrove Garden' (BBC Scotland) presenter Carole Baxter was born there. The novelist Ernest Elmore (who also wrote as John Bude) lived in Loose in the 1930s. ^ "Civil Parish population 2011". Neighbourhood Statistics. Office for National Statistics. Retrieved 15 September 2016. 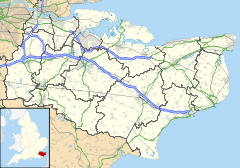 ^ "Historic Kent - Villages and Towns". historic-kent.co.uk. Retrieved 2010-05-05. ^ Catalog of Copyright Entries. New Series: 1931, Part 1 (Washington, DC: Library of Congress), p. 2054. Wikimedia Commons has media related to Loose, Kent. This page was last edited on 2 April 2017, at 18:30 (UTC).